Your scripts do not need to be organized to work. Just like you can throw all your music CDs in a drawer, you can throw all your scripts in the overview dialog box as well. The problem with both of those cases is finding what you want, when you need it. Then you can step back and say, "Perhaps I need to organize this mess." A developer would name a script “ --- Calendar Related --- “ and have no script steps within it. then put the script in a logical position in the script order. This may sound strange to newer developers when they open up a files script library and see all these empty scripts! In the modern versions of FileMaker, you can have your scripts within folders or create separator objects between scripts. 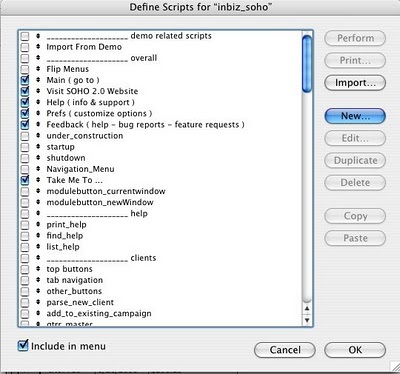 This feature can be found in the lower left corner of the script overview dialog box. I really love the folder concept and have commented how I extend this framework vision to my relationships and fields via naming conventions. By the way, a separator is an empty script, FileMaker attempts to hide that fact from you with their version of curtains and drapes. Also I often put a prefix on my scripts to tell me what they do ( BTN for button - OPS for operations). Another technique is to indent subscripts from the script that calls upon it and place it below that script.